WATER - the foremost requirement for life, and our lifestyles. The humble windmill has been used, for more than a millennium, to pump water and was the single, most important, piece of machinery which allowed our forebears to utulise land which was, otherwise, unable to sustain us in our agricultural and industrial endeavours. Windmills still harness the energy which is free to us all. We are proud to present The Ferguson Windmill for your assessment. Every effort has been made to combine simplicity of design with the best of materials and manufacturing procedures to bring you a product which has proven itself in service and reliability. Compare it with the alternatives. THE DESIGN The Ferguson Windmill is very sturdily constructed and has been designed to give a long life of useful service. The simplicity of design makes for fewer things to go wrong and therefore you can expect many many years of trouble free running. The tail-less fan and pivoting head run on high quality regreasable ballraces. The crank bearing is also regreasable. 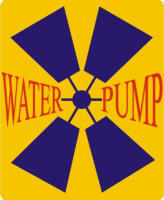 The pump is constructed from non-rust materials, i.e. bronze body - stainless steel pump rod - leather washers and stainless steel inlet valve in a brass body whilst the mast, pivoting head, blades, fan arms, screw anchors, etc. are all hot dip galvanised. PRACTICAL USES The Ferguson Windmill can pump an average of 2300 litres (500gals) of water per day and is able to lift up to 7.5 metres (25ft) and pump to a vertical height of 52 metres (175ft). In conjunction with an adequate reservoir this makes the mill ideally suited for stock watering, crop irrigation, household water and in fact any situation where there is a need to move medium volumes of water or other liquids. The pumping characteristics of the mill means that it is unnecessary to dig out large, costly, ponds or dams when there is a constant supply of water such as a spring or stream because the draw-off rate is low and allows the supply to replenish itself naturally. Marginal Water Supply Reticulation System SITING It should be noted that it is not always necessary to site the Windmill directly alongside the water source. It may be more practical to place the mill some distance from the water and possibly downhill in some cases so that the pump is gravity fed just as long as the maximum lift (suction) height is not exceeded when lifting water to the pump. Click here to find how to check levels. INSTALLATION Mills are readily assembled and erected on site by two unskilled people with only a few handtools - no power, cranes etc. required. The Windmill mast and stays do not require concreteing into the ground, which greatly reduces assembly time. Full instructions for setup and erection are supplied. WHAT WE SUPPLY MAST :- 3.5m (11'6") single pole hot-dip galvanised complete with connecting rod, alignment blocks and clamps, stay wires, tensioners and ground anchors. HEAD ASSEMBLY :- Galvanised pivoting head with regreasable rod-end crank bearing, crankshaft bearings and pivot thrust bearing, - electroplated crankshaft with fitted cast alloy fan hub. FAN :- Six bladed 1.8m (6') diameter all galvanised - ready to assemble to fan hub on head assembly. PUMP :- Heavy cast bronze body (to withstand freezing) - stainless steel pump rod, inlet valve and ball valve - brass valve bodies and outlet valve - bronze gland sleeve - low friction gland piston with fitted O'ring seal - and high quality bark tanned leather cup washer. 35mm (1 3/8")bore x 38mm (1 1/2") stroke. Click here for a view of the PUMP EXTENSION MAST :- 3.25m (10'9'') single pole hot-dip galvanised complete with connecting rod,alignment blocks and clamps, mast joining clamp, stay wires, tensioners and ground anchors. MAINTENANCE As all component parts of the mill and pump are of very high quality just a small amount of grease and a visual check, to ensure guywire tension, etc., is the only regular maintenance required. DELIVERY Shipping weight: Approximately 67kg. (143 lbs.) Shipping Dimensions: Mast: 3500 x 280 x 100mm. + Box of Parts: 600 x 400 x 300mm. = 0.17cu metres. 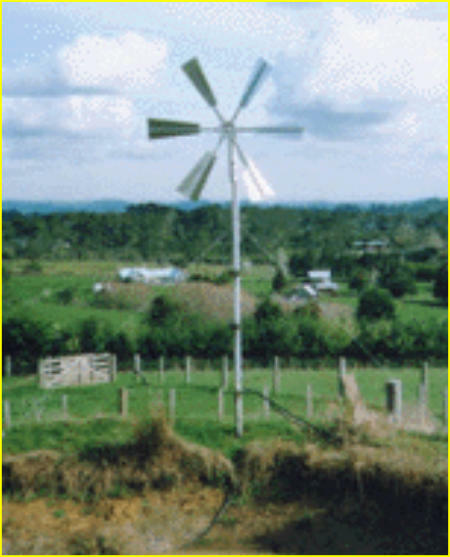 (6cu ft.) (Standard windmill only - please enquire about extension mast weights and dimensions) FREIGHT FREE throughout North & South Islands of New Zealand to your nearest national carrier's depot. PRICING Prices as at :- January 2017. (Including Freight within NZ.) Complete windmill includes - 1.8m. (6ft.) fan and head assembly, standard mast, pump, and accessories - $3195.00 (= $2778.26 + GST ) Extension mast and accessories - $789.75 (= $702.00 + GST ) Prices are quoted in New Zealand currency and GST only applies to NZ customers! As we have no control over material costs, prices are subject to change without notice. GUARANTEE Each Windmill is inspected before it leaves our premises and, subject to fair wear and tear, it is fully guaranteed against faulty materials and workmanship for a period of 12 months. This guarantee applies also to the pump, but does exclude wear and tear on the cylinder and valves and/or clogging of the valves due to corrosive or dirty water supply.